Midwest Dramatists Center: Springfield theatre to produce Michelle T. Johnson's "Rights of Passage"
Springfield theatre to produce Michelle T. Johnson's "Rights of Passage"
From world premiere to world premiere: only a few months after its first-ever reading at MDC, Michelle T. Johnson's new play Rights of Passage will receive its first full production, courtesy of Big Momma's Back Porch Theatre in Springfield, MO. 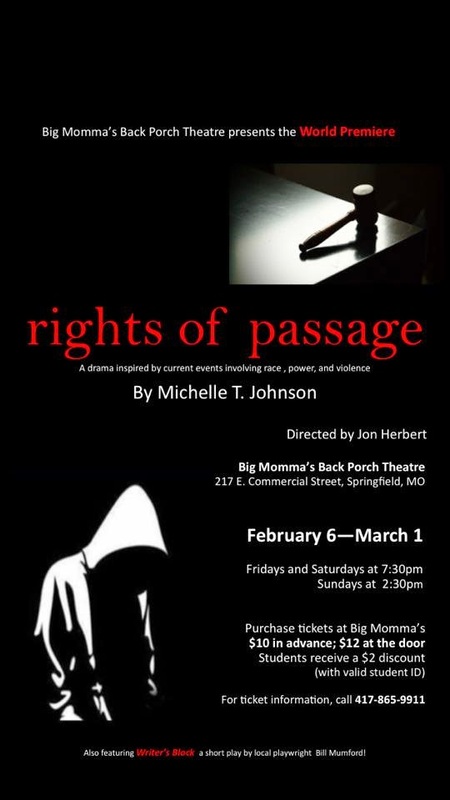 "A drama inspired by current events involving race, power, and violence," Rights of Passage was developed at MDC by Johnson this fall as news continued, and continues, to flow from Ferguson, MO. Jon Herbert, a theater professor based in Springfield, heard about the play's staged reading at MDC on October 13, asked to read the script, and arranged this production, which he will direct. Performances will take place over four consecutive weekends, February 6 through March 1, 2015, at 217 East Commercial Street in Springfield. For tickets and more information, call 417-865-9911.